Dr. Ahmadur Rahman always appreciates feedback from his valued patients. To date, we’re thrilled to have collected 50 reviews with an average rating of 4.92 out of 5 stars. Please read what others are saying about Dr. Ahmadur Rahman below, and as always, we would love to collect your feedback. Super friendly team in a relaxed and welcoming space! Dr Rahman is easy to talk with and takes his time explaining everything! I was able to make an appt on the website and be seen within the same week. 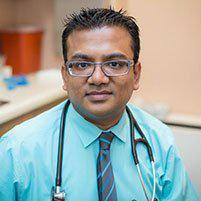 Dr. Rahman is very professional and nice. Great experience! Doctor was thorough and had a great bedside manner. Straight and to the point in the best way possible. Nurses and staff were excellent as well. Efficient and capable and friendly, all I can ask. I am very happy with my experience. The office is very professional and the doctor was able to able to help me. Dr. Rahman and his staff are great! Dr.Ahmadur is a great doctor. He was very professional. Dr. Rahman was very pleasant, and friendly. Cared about the check up. Front desk was also nice to deal with. Smooth appointment, started almost exactly on time. Dr. Rahman was not too rushed and the nurse who took my blood samples and gave me my flu shot was very skilled and kind. I'm glad to have found a doctor I like so close to home! My first time seeing Dr Rahman after a co worker referred me to him. I had a cold over the weekend and was able to see him on Monday, the receptionist were professional the wait was short and he was very friendly and informative. Dr. Rahman is the best! Very quick no wait. Staff was really friendly. I was able to get a quick appointment when I needed it, thanks! Always thorough and competent and friendly. Great Experience! Staff and Nurses are wonderful, as is Dr. Rahman.